It was by an accident of timing and geopolitics that these great mountains were first climbed in the fifties and sixties. Major European and American expeditions had made attempts on several of the 8,000-meter peaks in the twenties and thirties, but then the outbreak of World War II put these expeditions to a halt. When they resumed after the war, the Cold War had begun, and the subsequent mountaineering conquests took place in the context of this global struggle of ideologies. In 1960, the Chinese government launched an expedition on the north side of Mt. Everest, which stands in Tibet. This was the first expedition on the Tibetan side since China had annexed the country in 1950. The government reported that three climbers reached the top of the mountain and left a plaster bust of Chairman Mao there as a memento of their visit. Mountaineers in the West generally doubted that the Chinese party had actually made it to the summit, as the only accounts released were party propaganda with a little mountaineering on the side. (The Chinese summiting is more widely accepted as veritable now.) Whether or not the Chinese climbers really reached the top, the expedition was a geopolitical coup, an assertion of China’s sovereignty over Tibet. Three years later, a very different expedition attacked Everest from the southern side, through Nepal. This was the American Mount Everest Expedition 1963, or AMEE for short. Well-equipped, well-staffed (with 20 expedition members, 37 high-altitude Sherpas, and 909 porters), and well-funded by donations and government grants, the expedition was also highly-publicized. The expedition leader, Norman Dyhrenfurth, was a cinematographer by trade; he produced a movie about the climb and got Orson Welles to narrate it. One of the six members of the team to reach the summit was National Geographic Society photograph Barry Bishop. The expedition even had its own chronicler, mountaineer-author James Ramsey Ullman, who wrote a piece for Life magazine, the script of Dyhrenfurth’s movie, and a full book, Americans on Everest (which is a good read). Yet even if the men who actually climbed the mountain did not do so for national glory, the expedition had to present itself in a national context in order to get funding. The American public and government asked: Why climb Mt. Everest? It has already been climbed. To which AMEE replied: Because it has never been climbed by Americans before. The rhetoric convinced individuals, mountaineering clubs, companies, and the US government to donate $400,000 to the expedition. The State Department funded expedition costs in Nepal with a grant of $82,000 in Indian rupees, which the US government had earned from the sale of American wheat and other agricultural commodities to India under the PL-480 Food for Peace program. The State Department also funded a goodwill tour of selected expedition Sherpas around the United States after the climb. A great, friendly American expedition to Asia aligned well with then-President John F. Kennedy’s internationalist agenda, which also produced the Peace Corps and USAID. 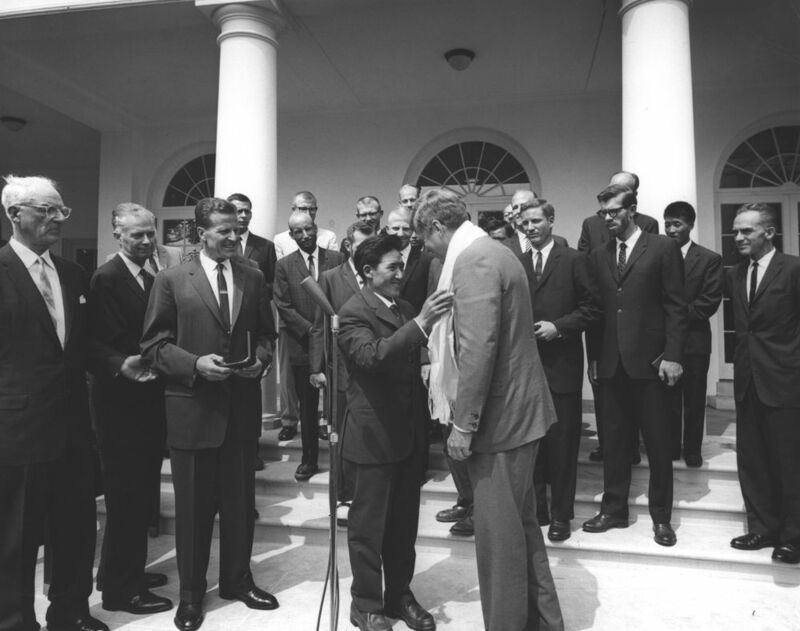 When Kennedy presented the National Geographic Society’s Hubbard Medal to the expedition after the successful climb, he emphasized the international character of Himalayan mountaineering, citing other nations that had preceded the Americans to Everest. But he omitted the Chinese, as China was on the wrong side of the Iron Curtain and this was the Cold War after all. 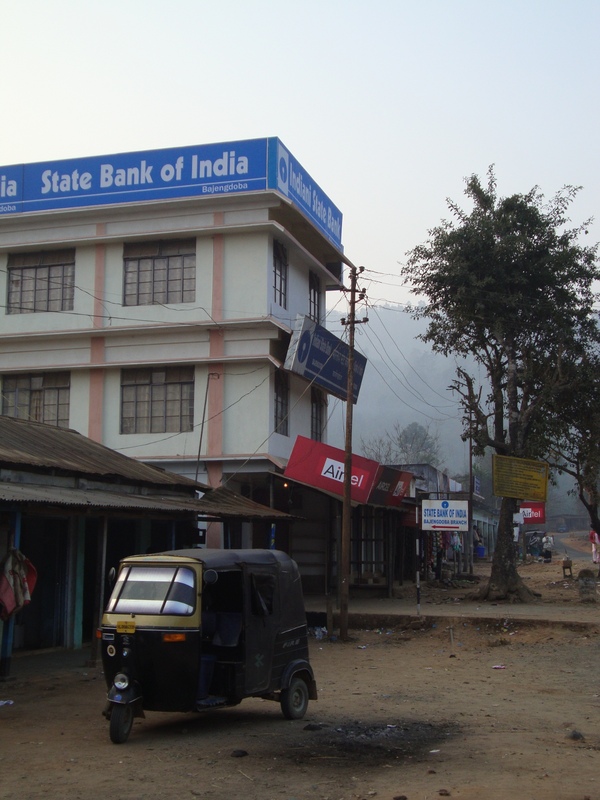 At the beginning of my sojourn in the Garo Hills of northeast India, I was surprised—among other things—to see technologies in use that I did not know were still used anywhere in the world. Farmers plowed their fields with ox-driven plows. Blacksmiths at local markets made knives and axes—not for tourists but for local people to use in their everyday work. Despite the presence of these technologies that I could have considered hopelessly obsolete, I never felt that I was in any time besides the twenty-first century. American celebrity news in the Calcutta Telegraph made sure that northeast India, as isolated as it may have felt, was still very much a part of the modern world. 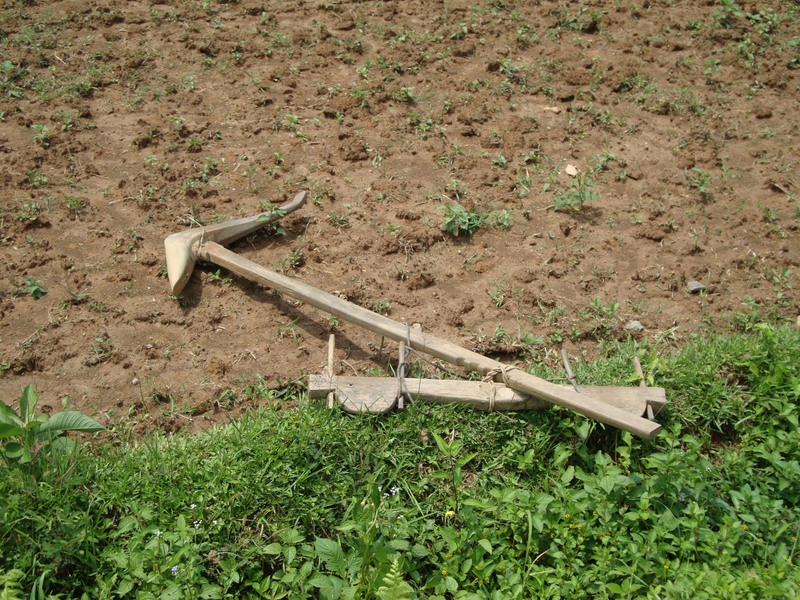 Old technologies never die: An ox-drawn plow used in the Garo Hills. 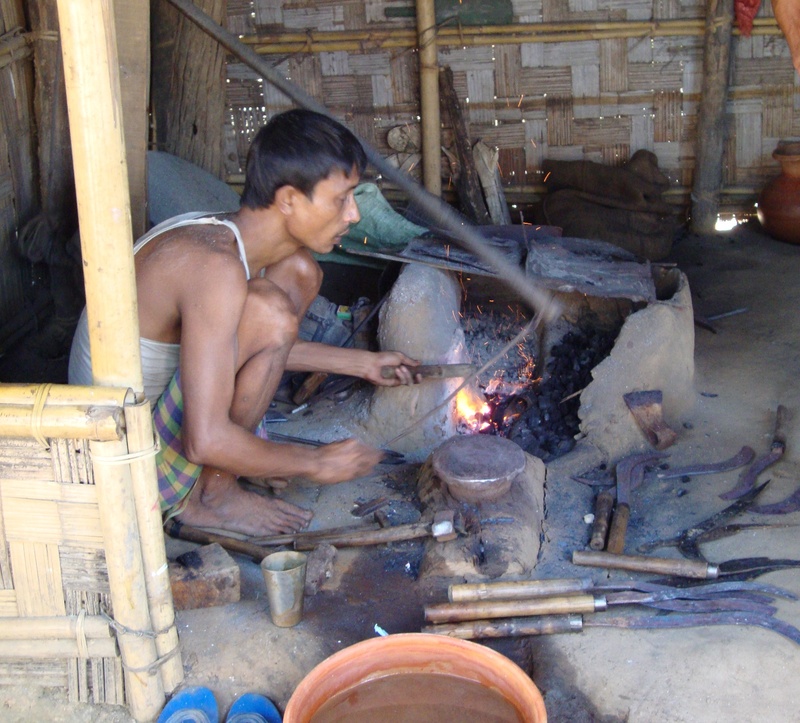 A blacksmith making tools for everyday use in the Garo Hills. In the Garo Hills, I saw a variety of old and new technologies used side-by-side. My downstairs neighbors embodied the mixed use of old and new. For entertainment, they watched any of a hundred channels on their satellite TV, or popped a VCD into their player—a format that never caught on in the West, but thrives in India. The parents carried cell phones, as did most or all of the other teachers at my school. They cooked on a gas stove, often with a pressure cooker (a 19th-century invention based on 17th-century principles). They washed their clothes by hand and dried them outdoors on clotheslines strung up between areca palm poles. The effective mixture of old and new technology was a surprise to me because I, like most westerners, tended to think of technology in terms of innovation. In The Shock of the Old, David Edgerton argues that histories of technology should be based on use rather than innovation. Innovation-based narratives exaggerate the importance of technologies that are new, while ignoring old technologies that continue to be used around the world.1 In other words: tractors may be in almost universal use in the West, but many people around the world still eat food from fields tilled by ox-driven plows. The Shock of the Old is a useful framework for thinking about Indian technology. As Edgerton remarks, a use-based narrative allows every place to have a history of technology, not just the centers of innovation. Western consciousness of Indian technology is usually restricted to the tech centers in places like Bangalore and Hyderabad. But every place uses technology, and can thus be discussed in a use-based narrative. An autorickshaw (foreground), an adapted scooter taxi that originated in India in the 1950s. 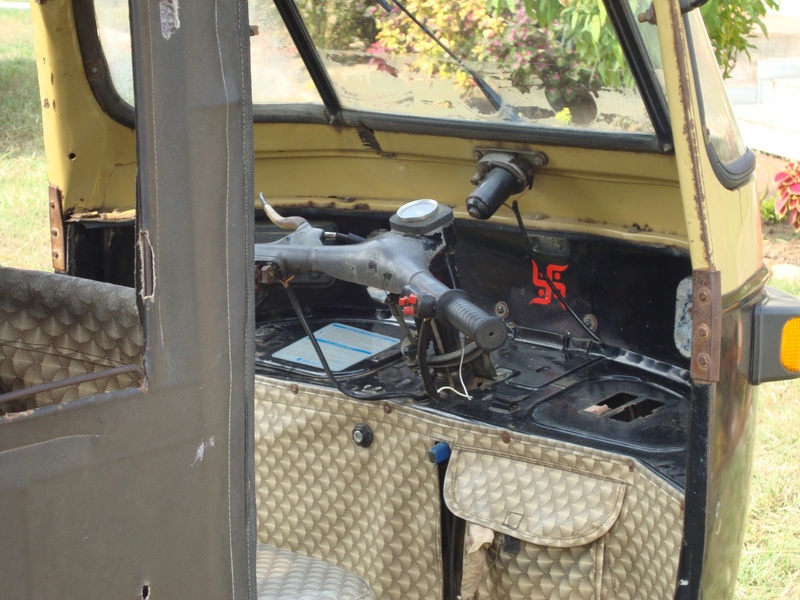 Interior of an auto-rickshaw, showing its scooter-style handlebars. I argue here that India’s judicious use of resources was partly necessitated by Cold War politics, India’s non-alignment restricted its access to technology from the industrialized superpowers. Although India received development aid and technology transfer from both the United States and the Soviet Union, India did not receive as much aid as countries that aligned themselves with either side. Another, more extreme, example of a country whose access to technology was inhibited by Cold War politics was Cuba. In the 1950s, Cuba imported American automobiles and consumer goods, but this trade was abruptly suspended after the communist rise to power in 1959. Cut off from American goods because of the trade embargo, Cuba had to rely on the distant Soviet Union for manufactured items that it could not produce indigenously. Throughout the remainder of the Cold War, and even to the present day, American cars, built in the 1950s, continue to be used in Havana. Some antique cars are restored and used to attract tourists; others are cannibalized for spare parts. As Viviana Narotzky writes in an essay in the collection Autopia: “A ’58 Dodge may have a Cadillac front grille, a Skoda radiator, a Plymouth fender and a Honda wheel cover. The brake fluid will be 50 per cent shampoo. None of the push-buttons will work.”3 The continued use of half-century-old American cars in Cuba represents an ingenious adaptation to political and economic conditions. My previous post quoted journalists and bloggers who touted Indian jugaad as the key to their country’s economic success. As this post should make clear, technological improvisation and adaptive reuse are not unique to India; they are performed worldwide, from the poorest country to the richest.5 But Indian jugaad is perhaps distinctive because it takes place on a vast range of scales, from projects as small as Subash rigging up wires so that his wife can use her oven, all of the way up to aircraft carriers and hydroelectric dams. In early independent India, the government as well as individual citizens had to improvise technological solutions.